This is a compound microscope on a tripod base. The body is a single piece of ivory that is externally threaded on the objective end and internally threaded on the eyepiece end. Fixed to the lower end of the body is a dark wood (possibly Lignum vitae) nosepiece into which an objective lens is mounted. The obverse side of the lens is convex, the reverse shape is unknown. 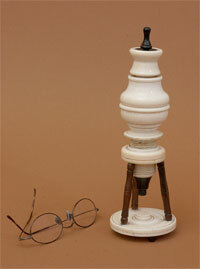 The eyelens is mounted at the base of the (presumably) threaded ivory eyepiece, and a dark wood insert is mounted the top of the eyepiece. A threaded peg can be screwed into a hole in this piece to act as a dust cover. When removed, the user looks through the threaded hole. CT scanning revealed only two biconvex lenses: an eyelens and objective lens. This microscope does not have a field lens, thus it is likely that it was made before 1660. Monconys invented the Field lens in 1660, and Campani started adding it to his instruments c1661. 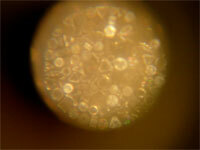 Illumination of the sample is by reflected light only; there is no provision for transmitted light. Focusing is accomplished by turning the microscope body, similar to Microscope No. 124 in the Golub Collection. 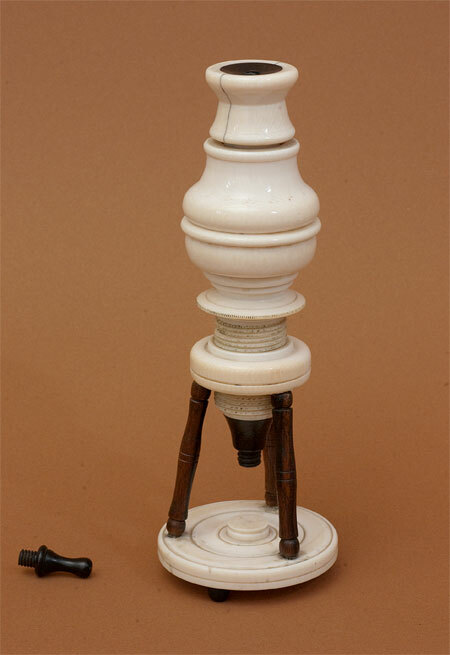 The base is a circular piece of turned ivory, 6cm x 6mm, with an ivory peg in the center. The peg acts as the sample stage. The microscope mounting ring is supported above the base by three turned wood pillars. The base sits on three small wooden legs, the placement of which alternates with the pillars. Imaging is poor due to low contrast and lens aberrations. The microscope is 23cm tall. There are no known instruments similar to this one in the Collection, however, its design is similar to microscopes from Eustachio Divini of mid-17th Century Italy.